WARNING: The following material is for diehard Galaxy S III fanatics only! That said, you might have noticed that we've seen a good number of Galaxy S III mock-ups appear over the last few months, some of which quite convincing (others not so much), and we're not even counting the ones specifically tagged as fan concepts. Whether or not any of those designs may turn out to be real is still beyond us. However, we thought it might be fun if go out and gather all of those bad boys, so that everyone can take a good look at them here, in the gallery below. We've also made sure to put a short description next to each one, as well as some rumored specs associated with it. Well, what more can we say - in case the Galaxy S III is the first thing you think about when you wake up in the morning, then we guess you'll simply love our sweet mock-up collection below! This is one of the earliest Galaxy S III mock-ups. Hitting the internet last October, it actually treated us to a tiny picture of the device, allegedly being part of an internal communication slide. Thankfully, the pic was also accompanied by a number of exciting specs. This is where we first heard about the 4.6" Super AMOLED Plus HD screen, 1.8 GHz dual-core Exynos processor, 2GB RAM and 12MP camera. This image represents a bit of a deviation from the typical Galaxy S look, and seems a bit more similar to a Samsung Wave device instead. The next big thing in the still full of mysteries world of Galaxy S III happened on January 17, when Samsung showed a video during its CES press conference. Interestingly, one of the devices that were featured there was an unfamiliar phone, in which, of course, many of us immediately saw the Galaxy S III. Sadly, the company continues to be silent about this device, so we still don't know exactly what it was and if it was real at all. This is one of the more recent Galaxy S III mock-ups. It emerged on March 17 and was claimed to be the "final design" of the notorious handset. Obviously, its maker has envisioned a Galaxy S III with no physical buttons on the front, which is something that's absolutely possible. However, the TouchWiz screen that we see causes us to have a few doubts about the image - like the suspiciously big font used for the widget. 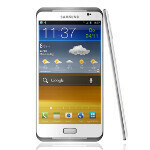 The author was right for one thing, though - we're sure to have TouchWiz on the Galaxy S III! This image is actually a lot more plausible than what we saw until now. Not only does the phone look good on it, but it's actually something that we'd gladly give our money for. The whole image was about an eventual May 22 event in London, where Samsung is supposed to unveil the device at 6PM! Other than that, no other info was made available, save for the obvious presents of the TouchWiz UI on top of ICS. Probably inspired by the March 17 leak, a dedicated PhoneArena reader sent us their own take on the mock-up. Sure, the image might not present us to any additional details, but it does let us take a better look at an enhanced version of the device in question. This alleged picture of the Galaxy S III also appeared on March 18, but it brought us two things: the first is yet another new design suggestion, and the second one is a nice list of specs, including a 4.7" screen, 1.5GHz quad-core Exynos 4412 processor, 12MP camera and an uni-body ceramic casing. Sounds hot, we know! This one actually isn't a mock-up, because the handset in the picture is perfectly real. This is supposed to be the Samsung GT-I9300, which many consider to be non other but the Galaxy S III (there was a much earlier rumor, however, which said that the Galaxy S III will have the GT-I9500 model number). The interesting thing about it is that the GT-I9300 actually made an appearance in the form of a leaked UAP profile on the web, where the additional info pointed at a display resolution of 600x1024, which we are sure not many Galaxy S III fans are willing to settle with. Which is your favorite Galaxy S III mock-up? Do you believe that some of these is the real thing? By the way, if you want to know more about the Samsung Galaxy S III, be sure to check out our comprehensive article: Samsung Galaxy S III: design, specs and release date rumors. didn't expect to see my render here, thank you phonearena! :) 5 of 6.
make that 5 of 7? lol. wow spacebar is working now but damn i cant edit my first comment. sorry people. Nice work. That is a design I can get behind! i'll try if I have time. i'm kinda busy since i'm graduating. white phones are easier to fake since the reflections of white are not usually seen. and I agree with you on the i9300, looks fake and disgusting. I still say that "9300" is an SGS1 with a bad photoshop. The glare on the screen doesnt match the glare on the phone. Dimension wise, its exactly like an SGS1, with the samsung logo moved down a smidge for the screen. the question i have is always about what touchwiz 5 would look like. I would assume it would be kind of similar to 4, but less intrusive. Of course, its already leagues less intrusive than Sense, which is why i can deal with it, but i digress. lol the main calendar widget you use in your mock ups will probably be scrollable. all my stock widgets are scrollable in ICS, so I'd assume Samsung (and HTC) would follow suite. I like the 3rd and the 5th!!! They really stand out of the crowd!! That's what i would expect! I get so excited with this, I need a smartphone fix right now. I do hope they retain the removable battery + regular sim + micro sd slot combo and not go the HTC one series way. Removable battery ? I dont think so. Unless this phone has AMAZING battery life, I'm talking a minimum of 12 -14 hrs of talk time, I would want a removable battery. If I wanted to be tethered to a cord, I'd get the iPhone. I'm often out and about, without the ability to plugin. I want/need to be able to change the battery, and keep going. Unibody design will keep me away from the HTC One X. I can't say I'd buy the SIII if it is unibody. That would be a HUGE disappointment. MicroSD slot goes without saying. wow.. that's cool. i do love the 5th photo.. thats awesome. I don't really care about the looks. I also don't care if it's plastic, every phone I ever owned was plastic. I am a complete specs whore and 2gigs of RAM, quad core Exynos, 4.7" super Amoled HD & the other specs rumors get me horny! Problem is that I am infatuated with the 5.3" Galaxy Note so this Galaxy S3 will have to drop bombs to tear me away from my current love. It is an internal struggle everyday just to stop myself from ordering a G.Note & I know the workers at Best Buy are sick of me coming to visit it. I like 2 and 5. Am I the only person upset about the future lack of capacative buttons?